Little Kids® Inc. was founded in 1989 by toy industry leader and former Toy Industry Association Board Member, Jim Engle. Little Kids develops, manufactures and markets innovative and award-winning bubble, novelty, sports and activity toys. Consumers recognize Little Kids toys for their high quality, value and durability that promote thoughtful and creative play. Little Kids brands include a line built upon No-Spill Bubbles, a category the company created with its patented No-Spill® Bubble Tumbler toy. Other Little Kids brands include My First Bubbles®, Junk Ball® Sports, Crunch Art® and Press Dough™ food activity toys. Little Kids licensed toy portfolio includes Nickelodeon and Jelly Belly bubble and novelty toys. Little Kids is privately owned enterprise headquartered in Seekonk, MA. 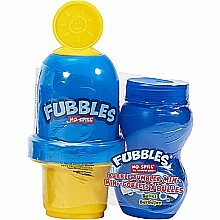 Little Kids Fubbles No-Spill Bubble Tumbler Mini 2 Fl. Oz. © 2019 Specialty Toys Network, © 2019 Imaginations Toys or its affiliates. All Rights Reserved.